A cache of fonts installed in your system. When cleaning this cache, SecretBurner doesn’t remove the installed fonts, only their cached copies. A cache of GDI+ fonts installed in your system. When cleaning this cache, SecretBurner doesn’t remove the fonts, only their cached copies. A cache of icons of the applications that have started at least once, that your system stores to show them faster in Taskbar, Start menu, and Program icons. When cleaning them, SecretBurner doesn’t remove the icon files, only their cached copies. Information about Shell extensions (i.g., added shortcut menu items) of programs installed in your system. When cleaning this information, SecretBurner doesn’t remove the extensions, only their cached copies. A cache of WPF (Windows Presentation Foundation) fonts your system stores to optimize their performance. When cleaning this cache you remove only the font’s cached copies, not the fonts themselves. Content of the system clipboard. A list of shortcuts that exist on your Desktop but not linked to any existing files. You may select the shortcuts you want to delete. A list of registry records for most frequently used programs, start menu links, and icons. A list of log files created by various services for troubleshooting. A list of links to files recently opened directly from programs via the Open File dialog box. Files opened from Windows Explorer, by clicking their desktop icons, etc, are not included into this list. 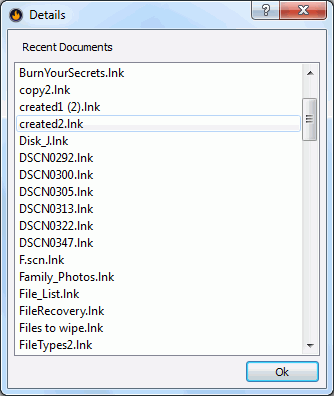 A list of links to documents (registered file types) recently opened in the system, directly from programs, Windows Explorer, by clicking their desktop icons, etc. This list appears in the Start menu. Files moved to the Recycle Bin. A list of programs that you have launched from the Run bar. A list of application descriptions and paths for applications that started at least once. A list of folders which View settings in Windows Explorer have been changed. A list of temporary files created by your programs that SecretBurner can clean. A list of system temporary files that SecretBurner can clean. A cache of thumbnail images of file types that provide them to the system. Your system stores copies of those images for faster access. 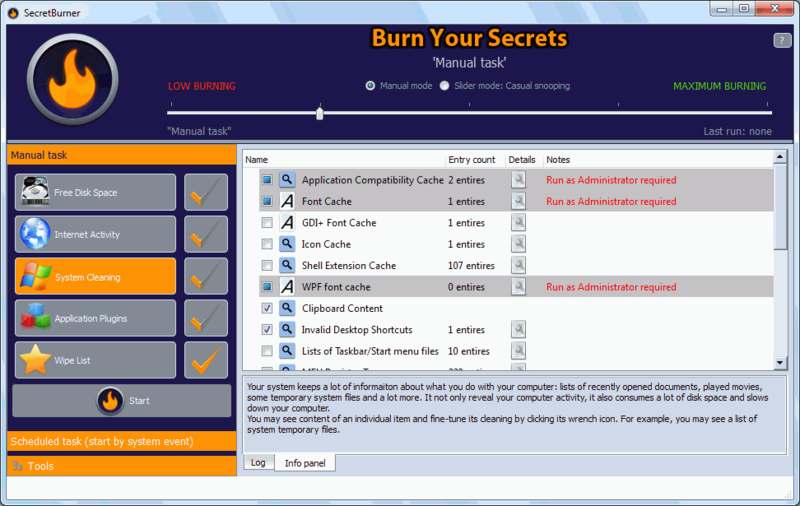 There're some items in the list that SecretBurner cannot clean when run as a regular user. Such items are marked with Run as Administrator required. To clean such items, right-click the SecretBurner icon and select Run as Administrator on the shortcut menu.